The process by which a textile material is changed physically or chemically so that it looks colorful is called Coloration. 2. Discontinuous or exhaust method. This is the process where fabric moves continuously by the guide rollers. Fabric gets a very short time in liquor and goes to another bath in a continuous manner. So auxiliaries and additives can be applied in different bath. This process is done in open width form. So it has less crease mark problem. Normally dyeing of woven fabric is done by this method. This is the process by which exhaustion is done by immersing the fabric in dye bath. This is a discontinuous process. Fabric stays a long time in the liquor. This fabric is not connected to another bath. So all dye auxiliaries and additives are applied to fabric or liquor in the same bath. Dyeing is occurred in rope form, so there is some possibility of remaining the crease marks. Normally Knitted fabrics are dyed in this method. PH should be in the range of 7-8. Water should be odorless & colorless. Solid content < 50 mg/L. Batching preparation is the process where inspected grey fabrics are divided into different batches with reasonable quantity according to machine capacity. It must be carefully observed that each Nozzle of a machine contains equal length of fabric. Treatments before dyeing is called pretreatment. For example- Scouring, Bleaching, Enzyme wash, etc are the pretreatments. ■ Scouring is the process by which all natural and foreign impurities such as oil, wax, fat etc. are removed to produced hydrophilic and clean textile material. It is the vital process of wet processing. ■ Bleaching is the process of removing natural color of the material and give a permanent white color. ■ Scouring & Bleaching can be done in single stage or double stage. But mostly in single stage. For scouring & bleaching at first the fabric is loaded on to the bath . Required amount of water is taken to the bath . Wetting Agent & Anti creasing Agent is added. Scouring Agents (Caustic/Soda) & Stabilizer are added by the aid of dosing when the temperature reaches at 50° C.
H202 is added by the aid of dosing system for 5′ . The liquor is drained at 80° C.
After that chemical wash & enzyme wash are done. Soda ash Neutralize acidic part, Remove oil-wax. Wetting agent Reduce surface tension & helps to get wet. Ant creasing agent Helps to avoid crease marks. Stabilizer Stable the oxidizing reaction of per oxide. Per oxide Bleach the material by oxidation. 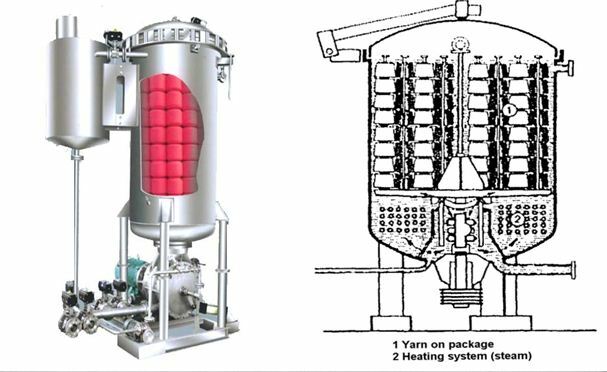 ■ Enzyme treatment technologies are frequently applied in textile processing for the modification of fabric handle, appearance and other surface characteristics in regard to cotton and cotton blended fabrics. ■ Hairiness of the surface is removed by enzyme treatment. ■ A dye, which is capable of reacting chemically with fabric to form a covalent dye-fabric linkage, is known as reactive dye. ■ Here the dye contains a reactive group & this reactive group makes the covalent bond with fiber polymer & act as integral part of fiber. ■ Reactive dyes are used for dyeing cellulose, protein & polyamide fibers. ■ Reactive dyes are found in powder, liquid & paste form. ■ During dyeing the reactive group makes the covalent bond with fiber polymer & act as integral part of fiber. ■ Reactive dyes are soluble in water. ■ They have very good light fastness with rating of above 6. ■ They have very good wash fastness with rating about 4-5 due to strong covalent bond formed. ■ They give brighter shade and have moderate rubbing fastness. ■ Reactive dyes are comparatively very cheap & easy to apply. ■ Fixation occur in alkaline condition. ■ They have very good perspiration fastness with rating about 4-5. ■ Wide range of color can be produced by reactive dyes. 1. Cold brand: They Contains reactive group of high reactivity. Dyeing can be done in 320-600C. 2. Medium brand: They Contains reactive group of moderate reactivity. Dyeing can be done in 600-710C. 3. Hot brand: They Contains reactive group of least reactivity. Dyeing can be done in 720-930C. It increases the affinity of fiber. It decreases the hydrolysis rate of dyes. It neutralizes the electro negativity of fiber. It increases the absorption of dyes. The amount of salt used depends upon the shade to be produced. It is used to maintain the proper pH. It is used as a dye fixing agent. Without alkali no dyeing will take place. As strong alkali Caustic Soda is used. As medium alkali Soda ash is used. As weak alkali Sodium bi-carbonate is used. By soaping the extra color is removed from fiber surface. Thus wash fastness is improved. Soaping increases the stability of dye. During this stage of dyeing, some reactive dye will be absorbed by the fibers, the amount depending upon substantivity of dye. This dye is capable of migration to promote level dyeing. Salt should be present initially or be added gradually to the dye bath during this phase to promote exhaustion. The temperature of the dye bath may also be gradually increased for penetration of dye into the fibers and to assist migration. ■ After the initial exhaustion phase, the pH of the dye bath is increased by gradual addition of the appropriate type and amount of alkali. This causes the reaction of dyes with fiber. ■ The fixation process then results in additional dye absorption, to re-establish the dyeing equilibrium. Dye absorption from solution and reaction with the fiber then in progress. The dyed fabric contains dye bonded to the cellulose, but also not reacted dyes in the surface. There will also be residual alkali and salt. These should be removed and neutralized by successive rinsing in cold and then warm water. As much unfixed dye as possible must be washed out. After every 10′ the sample is checked fixation occurs during this time. Rinse for 10′ & liquor is drained. The material should be neutralized to remove alkaline condition at room temperature by acid wash for 15 min & rinsing will be carried on for 10 min. Then soaping agent is added & temperature raised to 90°­-100°C for 10 min. The bath is cooled 7 rinsed for 10 min. Dye bath temperature then cooled to 60° C.
The unfixed dyes can be fixed by using fixing agent. at 50°C for 20 minutes. Softener is applied to soften the fabric as well as it improves the hand feel. The material is treated at 60°C for 20 minutes. Then rinsing again & material unload. The pH of the dye bath. Under alkaline condition reactive dye reacts with the terminal hydroxyl group of cellulose. But if the solution of dye is kept for long time its concentration drops. Then the dye reacts with the hydroxyl group of water. This reaction of dyes with water is known as hydrolysis of reactive dye. After hydrolysis dye can not react with fiber. So hydrolysis increases the loss of dyes. As hydrolysis increases with the increasing temperature; during dissolving & application, temperature should not be more than 400C. Dye & alkali solution can be prepared separately and mixed just before using. Dye & alkali should not be kept for long time after mixing. The reactive dye can not be satisfactorily stripped from fiber due to covalent bond between dye molecule & fiber. Stripping becomes necessary when uneven dyeing occurred.  1. Partial stripping: Partial stripping is done when shade become deeper than the requirement. Washing at 800C-1000C with Soda Ash (2g/L) can also give stripping. Hydrolysis occurs in high pH. This theory is taken for removing partial color from fabric by wash in high pH. 2. Full stripping: For complete stripping fabric is treated with sodium hydrosulphite or hydrose (2g/L) at boiling temperature with NaOH (2g/L). NaOH is used for maintaining high pH. Wetting agent: The chemical when applied on fabric can increase the wetting ability of fabric is called wetting agent. For example- Lissapol. Detergents: The chemical when applied on liquor can reduce the surface tension and remove the impurities from fabric that is called detergent. Such as- Soap. Levelling agent: The chemical which makes slow the dyeing rate so that even dyeing can occur is called leveling agent. Such as- Lyocol. Dye fixing agent: The chemical which fix up the dye with the fabric or yarn with a linkage is called dye fixing agent. Such as- Fixanal. Oxidizing agent: The chemical which can oxidize another material is called oxidizing agent. Such as- Hydrogen peroxide. Reducing agent: The chemical which causes the reduction of a material that is called reducing agent. Such as- Hydrose. friction that is called rubbing fastness improver. Such as- Turkey red oil. Defoaming agent: The agent which prevents foam forming in liquor that is called defoaming agent. Such as- Defoama. Softening agent or softner: The agent which brings a softness in the surface of fabric is called softening agent. Such as- paraffin wax. Stiffening agent: The agent which brings a stiffness in the surface of fabric is called stiffening agent. Such as- Resin. Water proofing agent: The agent which prevent a fabric to absorb water is called water proofing agent. Such as- Rubber. Weighting agent: The chemical which increases the weight of fabric is called weighting agent. Such as- Calcium carbonate. The term disperse dye have been applied to organic coloring substances which are free from ionizing groups are of low solubility and are suitable for dyeing hydrophobic fibers. The dye has derived its name for its insoluble aqueous dispersion. Of all the dyes, they are the smallest molecular size. Disperse dyes are non-ionic dyes. They are suitable for dyeing hydrophobic fibers. Carrier or dispersing agents are required for dyeing with disperse dyes. Disperse dyes light fastness with rating about 4-5. The wash fastness of disperse dye is in a rating of 3-4. They do not undergo any chemical change during dyeing. (I) Low energy Dyes: These dyes are used to dye with carrier. For dyeing 770C temperature is required. They have poor resistance to sublimation. (II) Medium energy Dyes: These dyes are used to dye mostly in between 1040-1100C which provides better sublimation fastness than that of low energy dyes. (III) High energy dyes: These dyes are used to dye at temperature above 1290C and are suitable for continuous dyeing. They have the most sublimation resistance. As disperse dyes are water insoluble, a well dispersion of dyes is required for level dyeing. For this reason a special chemical is used for dispersing disperse dye that is named as dispersing agent. A chemical which lowers the required temperature of dyeing with disperse dye by swelling action in the fiber which helps dye molecule to easy penetrate that is a carrier. pH required for disperse dyeing is 4-5. Acetic acid maintains the pH. 3. Costly as carrier is used and required to remove. 3. Not so costly. 4. Less bright shade. 4. More bright shade. 5. Toxic & unhygienic process. 5. Nontoxic & hygienic process. 6. More shrinkage. 6. Less shrinkage. 7. Method is not used now-a-days. 7. Method is in use.